Regardless of your skill level, consistency and technique are what most golfers desire in their golf game. Variation of either can alter a round of golf. Not only is it important for a player to understand how these two things affect their game, but knowing how to achieve them is also an important piece of the puzzle. We have a couple tips for increasing consistency in your golf game, especially when you are here for your Myrtle Beach golf package. If you are feeling frustrated or having consistency issues lately, don’t give up hope! Here are a few ways to help your performance on the golf course and a few ways to get you there. Even if your unique, these tips can help every golfer improve their game. Most people don’t think of the game of golf as having a high demand in physical ability. However, that is not the case. The endurance and strength that is needed to participate in 18 holes at one of the Myrtle Beach golf courses is vastly underrated! Lack of physical fitness can compromise your game of golf and the success and technique that you exhibit. Swim laps at the pool: This increases cardiovascular endurance while helping with flexibility at the same time. Greater endurance keeps your focus later in the round and better stamina, particularly on those hot summer days of when the humidity is high (as often is the case along the Grand Strand). Do low weight arm reps: These reps can help prepare the muscles that your arms use in a round of golf. 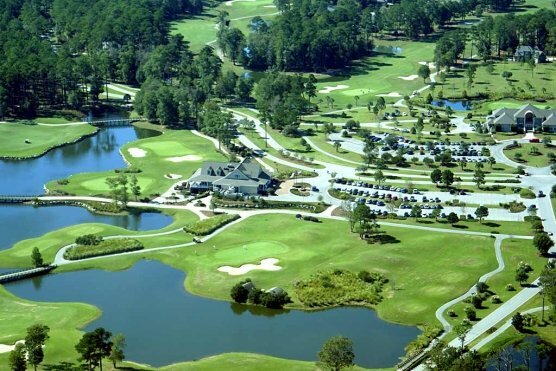 Remember, you’re swinging your club around a 100 times during each round of golf during your Myrtle Beach golf package. Walk on the treadmill at an incline: Most Myrtle Beach golf courses are not flat, so this will condition you for the ups and downs of the course and help prevent any fluctuations in your swing or stance during your rounds. Get a lesson: Contact your local golf pro and set up a lesson. This can be especially beneficial to do before arriving for your Myrtle Beach golf package. How often you get a lesson is up to you and your budget. The value of a lesson is what’s important. Consult someone who knows not only the fundamentals, but also the many tendencies golfers struggle with on a regular basis. Ask your buddies for recommendations. Play with people who are better than you: Whether you have to seek them out or you fall naturally into pairings with them on the weekend, you can learn a lot from your playing partners. This will help sharpen your focus and you’ll naturally acquire the little nuances that perfect their styles of play. Visit the range and putting green: Practice leads to improvement in the game of golf, especially when we’re talking about repetitions on the range. If your swing is the same every time, you’ll be able to expect the same on the course. The steadiness in your stroke comes from the range practice. The practice range will allow you to hone your skills in a controlled environment.